Mobile e-mail is very common today. People often read e-mails, including newsletters, on their mobile phone or smartphone. The display (screen) on mobile phones are much larger today than before so there is no problem to read e-mail messages directly on the phone, provided that the e-mail is not too large in size (not too wide or too long). A few years ago images in a newsletter could be a major problem and cause irritation because it took a long time to download the images, but today the Internet connections for mobile phones are so fast that ordinary images are no problem anymore, in terms of speed. They are downloaded immediately, just as for broadband connections. Using Internet through a mobile phone is also cheaper now than before, and often you only pay a fixed monthly rate no matter how much information you download from the Internet to your mobile phone. Mobile phones of today have also larger storage memory than before so the risk that downloading many e-mails will consume all available memory is very small. Today's cell phones have become more computer-like and so smart that they now are like small computers, or PDAs. Therefore, a new naming concept has been created when referring to the most advanced models: a smartphone. One of the most famous and best-selling smart phone today is Apple's iPhone, but Samsung Galaxy is also popular. 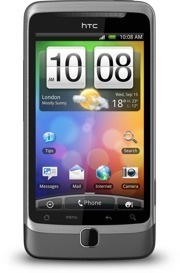 Also HTC has several popular phone models, such as HTC Desire. If many of your contacts read their e-mails on their mobile phone or smartphone, you can also expect that sometimes they will read your newsletter there. And in the coming years, the number of users of mobile phones with good e-mail capabilities will increase a lot. So the number of people who read newsletters on mobile phones will in the near future be many more than today. l Place a clickable link at the top of the email that points to a web page with a phone-friendly version of the newsletter. l Ask the recipient how he/she prefers to read the newsletter - in a computer or in a mobile phone - and use two different mailing lists with customized newsletters. l Create a newsletter that looks good in both computers and mobile phones. l Add script to the newsletter that automatically adjusts the newsletter after the display width. If you have a well-designed newsletter today it can be difficult to redesign it to fit mobile phones and smartphones. Then it may be better to create a simple version of the newsletter and place it on a web page on the Internet. At the top of the e-mail newsletter that you send to your contacts you can place a clickable link (a hyperlink) that opens the mobile version of the newsletter. Another possibility is to create two versions of the newsletter, and then ask the recipient where he/she prefer to read the newsletter - in a computer or in a mobile phone / smartphone - and then create two mailing lists with customized newsletters. If you do not want to create a special mobile version of your newsletter, you can instead try to create a newsletter that looks great both in a mobile phone's display and in a computer's monitor (screen). To achieve this you should try not to make your newsletter too wide and try to avoid using too large or too small pictures in the newsletter. A very small picture is difficult to see in a mobile phone's display and an excessively large picture can be found disturbing because it does not appear complete on the display and the user must scroll to see it. You should also avoid to use a too small font size because the letters could otherwise be difficult to read in the mobile phone display. If you are familiar with HTML you can by using style sheets (CSS) create e-mails that automatically adjusts the newsletter width after the width of the display. If you want to read more about this possibility you can read the short article: Adapt a newsletter for different display width (with the @media rule) on our site. l Have a short subject line. If you have a long subject line with many words, the last words will not be visible in the mobile phone's display. l Do not make your newsletter too wide. If the user must scroll too much sideways it can be perceived as very disturbing and he/she may refrain from reading the newsletter. l Sometimes it may be better to send plain text emails instead of HTML newsletters, if many of the receivers use a mobile phone or smartphone. Text e-mails has the great advantage that the line width is almost always adapted to the display or window width. This means that the reader does not need to scroll horizontally to read the e-mail. l Do not include very small pictures in the newsletter because they can be difficult to see on a mobile phone's / smart phone's display. And you should not include too large pictures because the reader then must scroll to see the whole picture, and it may be perceived as disturbing. l You should avoid light text on dark background for the body text because such a text may seem hard to read if the letters are small on the display. l Avoid a complex design and sophisticated graphics because it may appear incorrectly in some older mobile phones. l Important and interesting information should always be placed at the top and to the left in the newsletter because this part is the most visible on mobile phone displays. l If you want to give your customers an offer, or if you sell products, you should always have a phone number in the newsletter that is easy to find. Remember that it is a phone that they have in their hands so they can call directly if they are interested in your products. l If you use non-English characters in your newsletter, check carefully that they are shown correctly in mobile phones. If you have problems with non-English characters you can try to change the character set in the newsletter. Mobile phones have now been around for a while in the market, but smartphones have not been around so long even as Nokia have had models on the market for many years that at least they claim to be smartphones. But the big breakthrough for smartphones came when Apple released its iPhone. In addition to Apple's iPhone, Samsung has also had success with its Galaxy smartphone series, that uses Android from Google as an operating system. Another successful manufacturer of smartphones is HTC, which also uses Android in many of its models. Also SonyEricsson has a powerful smartphone, named Xperia and LG has released a powerful smartphone, named Optimus 2X, that contains a fast dual-core processor. Microsoft has long tried to enter the market, for example with its Windows Phone 7 (WP7) system, but the big breakthrough has not come yet. But this may change now because Nokia and Microsoft have announced that they will cooperate and develop smartphones together. Nokia will create the hardware and Microsoft will develop and maintain the operating system (Windows Phone 7). Both Microsoft and Nokia have large financial resources and high technical skills, so they will probably release a lot of interesting mobile phone models in the future. The future of mobile phones and mobile e-mail looks very interesting and all who send out a newsletter must start adapting their newsletters to the new situation that awaits. Newsletters will be read in mobile phones and smart phones more often than today. Sending an E-mail / Newsletter to Hotmail, Gmail and Yahoo!